"Believe it or not, glass is made from liquid sand. You can make glass by heating ordinary sand (which is mostly made of silicon dioxide) until it melts and turns into a liquid. You won't find that happening on your local beach: sand melts at the incredibly high temperature of 1700°C (3090°F)." "When molten sand cools, it doesn't turn back into the gritty yellow stuff you started out with: it undergoes a complete transformation and gains an entirely different inner structure. But it doesn't matter how much you cool the sand, it never quite sets into a solid. Instead, it becomes a kind of frozen liquid or what materials scientists refer to as an amorphous solid. It's like a cross between a solid and a liquid with some of the crystalline order of a solid and some of the molecular randomness of a liquid." ...more water. Into the sea. There, all the elements work on it: the fire of the sun drives wind and water, the moon drives tides, water, wind, earth (sand) and fire (sun) change the glass... round its corners, frost its surface. It never quite returns to the sand... or maybe it takes eons for it to reduce to tiny grains that are still glass. The pieces you find on the beach may be as recent as ten years old; it takes ten to thirty years to create that rounded, frosted look. The piece you just found might be hundreds of years old too, depending on how long people with glass have lived there. 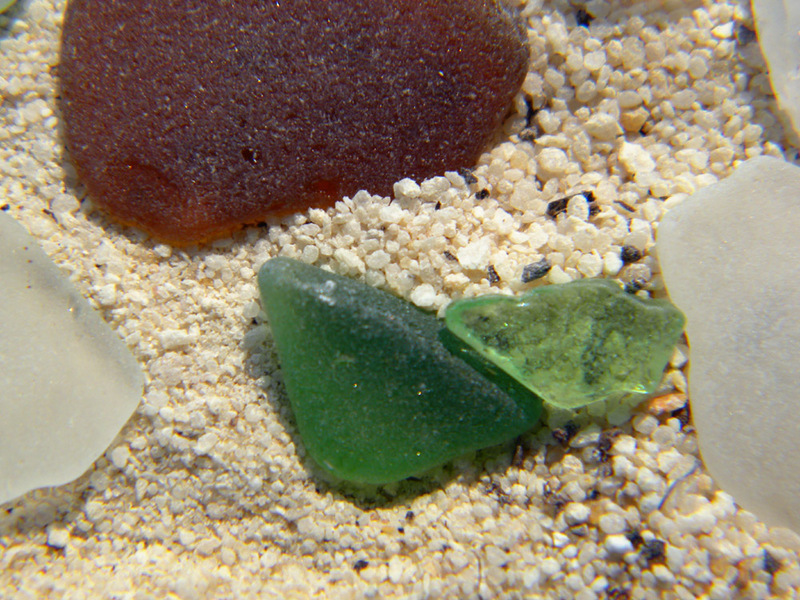 Beach glass originates in fresh water (river edges) and has a different pH than sea glass (tumbled in salt water). 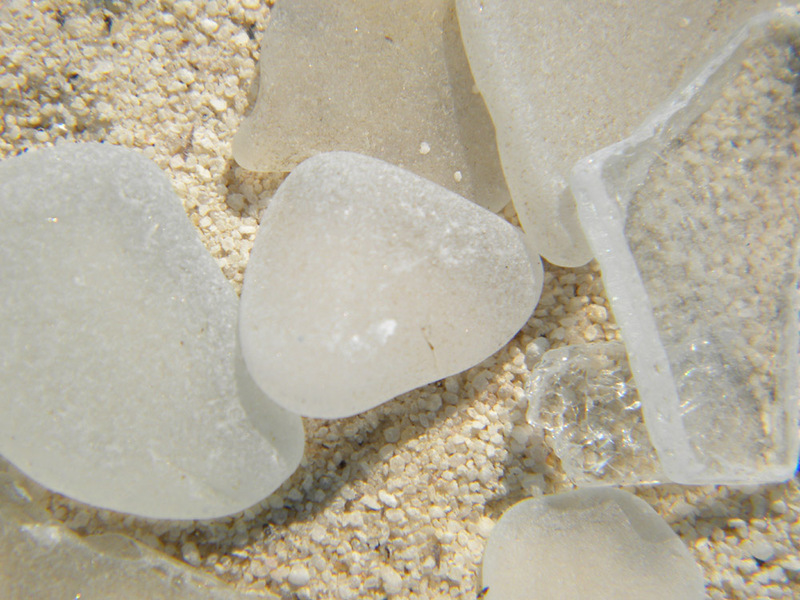 Fake sea glass or beach glass is often created in rock tumblers, or treated with acid, to create a similar look, and sold in arts and crafts stores. The real stuff carries with it the history of a place: its tides, weather, and the artifacts of its civilizations. The real stuff is separated by collectors into several categories from jewelry grade to throw it back and let it cook some more. Tolchester and Betterton beaches are some of the best places in the Chesapeake Bay to find sea glass. Betterton is at the mouth of the Sassafras River, that is tidal freshwater, the mouth opens into the Chesapeake Bay,, that part of the Bay is less than one-third of the way south to the salty mouth. The Sass is fresh, and the Bay at that point is barely brackish. Still, one finds sea glass. Most of these pieces are fairly small. A couple of the larger ones are from other beaches. Betterton was once "the jewel of the Chesapeake", the go to destination for tourists. When the Bay Bridge came, people crossed it to the eastern shore and ocean beaches. Betterton was nearly forgotten. Today, it is a small sweep of coarse orange river sand, groomed to keep out the sand burrs and trash. It's got a shady picnic area, restrooms, and a fantastic view of the open mouth of the Sass and the Bay. And fantastic sunsets. Park your umbrella (just not on holiday weekends when it is crowded), roll out your towel, and hop in the gentle waves of the Chesapeake. And look for sea glass. A bit farther south is the town of Tolchester, also once a resort. If you follow the road to the marina, you might be able to park in the back, and search the tiny sweep of beach for glass. There are no port-a-pottis or restrooms, but plenty of glass. Rock Hall MD is a great tiny beach where you can chill, or launch a kayak into open water. It has great views of the sunset over the Bay, gorgeous water worn pebbles, and occasional sea glass. Eastern Neck Island National Wildlife Refuge sits at the end of the Chester River. I've found mainly rounded rocks there. The beach at Bogle's Wharf has glass, but most of it, because it is in a protected cove, is fairly fresh. The same is true of Turner's Creek Park, in the middle of the Sassafras; lots of glass and stuff, but not well worn, because it's in a place with no wave action. Still can be cycled into crafts. Rock Hall is a tiny town at the edge of the Chesapeake Bay. Its quiet beach has parking right at the edge, a view of the open Bay, and great sunsets. Also a neat little museum tucked in the community building that houses the library. Eastern Neck National Wildlife Refuge: a bit farther south from Rock Hall, you can hike it, bike it, drive it, or launch a boat at Bogle's Wharf. Great visitor's center and hidden beaches. Lots of wildlife. Mouth of the Chester River, so, opportunity for glass to wash up. If you have a boat, check out the hidden beaches reachable by boat or by hiking down trails. Cape Henlopen State Park DE: great campground, bay beaches, ocean beaches, dunes, WWII watchtowers you can climb, lighthouses. And, apparently sea glass.